People who sign up for class sometimes come with a friend, but most brave souls come alone. Many new students will say “I tried to get my friend to come but she didn’t” or “I’m going to see if my friends will come next time”. A good plan but it often doesn’t come to fruition. 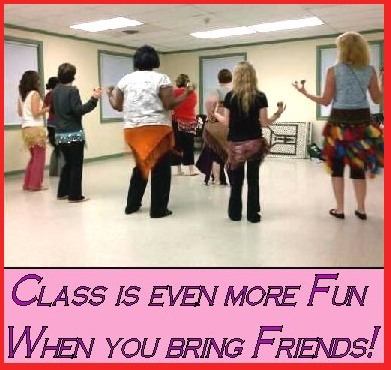 I’ve also seen students post online about their belly dance class or share class information, and that’s great too, yet not many new students result from it. Even so, I think these word-of-mouth referrals are the best way to promote class. Testimonials are great because they come from a positive place of wanting to share something good with others. So what can we do to make them more effective? Maybe a slight change of approach is all that’s needed to bring more of your friends in the door. When you’re chatting with a friend you think may be interested in belly dance, instead of saying “You should sign up for class”, pique their interest through your own experiences. Give them a behind-the-scenes look! There’s so many facets to belly dancing: the costumes, the music, the social activities - and testifying to this is a way to break through the false ideas so many people have about it. Show them the real deal! By helping them see belly dance from another angle, they might start to understand there’s more options for dance and fitness activities than gyms classes or pole dancing! Belly dance fills so many needs in our lives - exercise, mental stimulation, socializing, just plain FUN - that the more people we expose to the possibilities awaiting them, the better it is for them - and us!